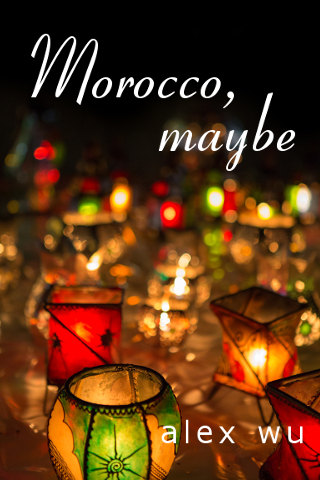 The cover for Morocco, Maybe took me forever to design. I browsed thousands of stock photos and hundreds of fonts. After narrowing down the images to two finalists, I made mockups and showed them around. About 25 people voted, and the result was close. The majority chose a photo of blue steps from Chefchaouen. That became the final book cover. The runner-up was a picture of Moroccan lamps. I liked them both. In the end, I could've gone with either one. Too bad I couldn't let my readers pick their own covers. The blue steps image has a lighter, cooler, and travel feel, even though it doesn't really evoke Morocco. One beta said it reminded her of Greece, which I agree. The lamps picture is heavier, warmer, and more evocative of Morocco. The glow of the lights amidst the background blur projects wistfulness. However, some people said that the red and green color scheme appears too Christmassy. After deciding on the image and the font, I played with them. For the words, I tried different sizes, different spacing, different placements. I ran the image through different effect-filters. All that work was very time consuming. It didn't help that I had to learn Gimp 2, a powerful but not-the-easiest-to-use image manipulation software. Obviously, a professional would've done the whole thing much more efficiently. But I wanted to learn about the process, so I had to try it myself. One of the best advice I've read about book cover design is that a cover doesn't need to look pretty, original, or even true to the story. The cover just needs to tell readers, as quickly as possible, what kind of story it is. The goal is to match the book to its audience. That's why books within a genre tend to have a similar look.